Don't Be afraid to BBQ if you are a GIRL ! Many of us ladies are just to timid to get in front of the grill ... and that's okay ! To be honest I think it takes some skill and some precision to grill anything well . But... at the same time.. I am a "when there is a will there is a way" kind of grilling girl too . So here are some tips on what I myself use to make sure that I don't burn my man's meat and keep it cooked enough for my kids to chop a bite too. The best part of grilling to me !? .... that you can put anything and everything on the grill and if done right it will come out amazing . ** I want to note that I think anything marinated over night is best but if you are in a pinch then try to give it at least 20mins to sit in marinade. Chicken Breast - (tip inside tip- I like to butterfly the breast so it cooks faster. Down side its not a juicy cause it is thinner) . * keep the flame low.. it will take a bit longer but keeping the flame low will give the char marks but not dry out. * it usually takes me about 7-8 mins on each side.. but always make sure chicken kits 160 deg ! * I like to close the lid the last two mins or so after shutting off the BBQ and I let the meat sit for a few mins then bring in and ready . * This meat is thin sliced and can come marinated or not. If it is not marinated a simple oil, garlic, lemon, salt, pepper, a few pieces of cilantro and a few onion slices can easily be a good marinate for Casne Asada. * Cooks fast and I try to only flip it once.. leave it until you can see its cooked through. Since this meat is so thin you can usually see when it is cooked through. * Season meat as desired - we like basic rubs on a hearty meat like this. Salt, Pepper and a little olive oil. * For Med-Rare I would suggest 5-7 mins on each side and for Med I would suggest 8-10 mins tops on each side and for those that like it Well done i suggest up towards 10 mins on each side. * When done - turn off the grill and let meat sit. I like to let it sit for maybe 5-8 mins to let the juices inside finish up the tenderness. Now what to do for sides !? Keep it simple and all in one place with veggies ! 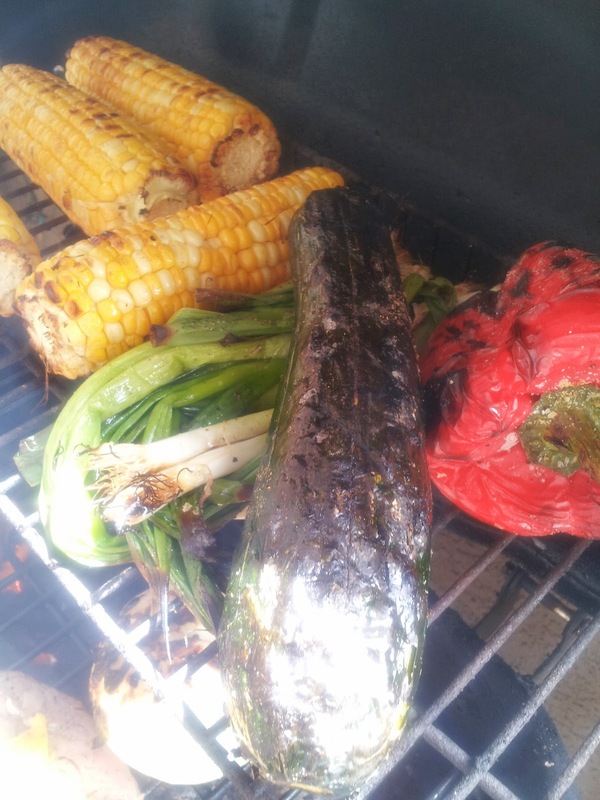 I added in a few long green onions, corn, large onion (my daughter loves it), squash and a red bell pepper. All season lightly with olive oil, sea salt, a dash of pepper and love ! 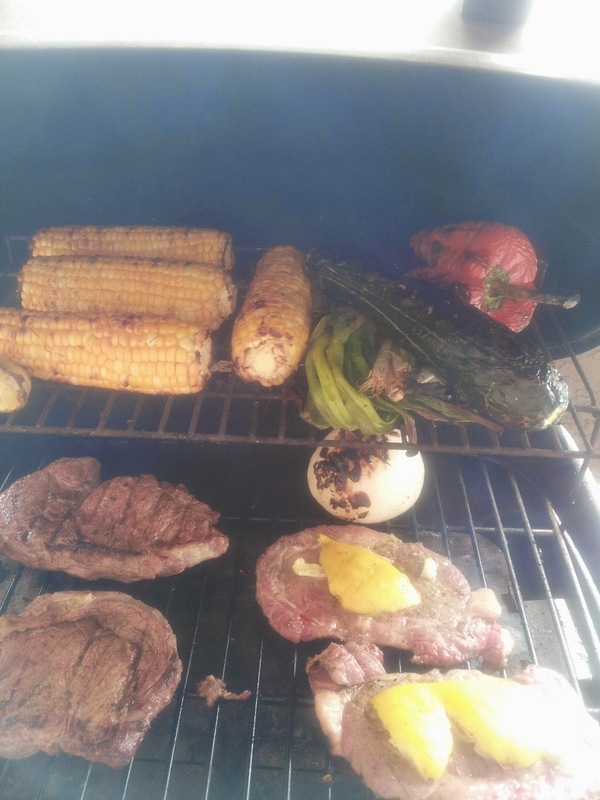 Started these on the bottom rack directly on the grill and aside from the large white onion, after about 10 mins, I moved them to the top to add the meat to the bottom . They stayed on the top the rest of the time. If you have any questions for details and or other cool tips please email, comment, or share !